Add garlic to brighten up savory winter dishes. In the dark days of winter, storage crops sustain us. Winter farmers markets bear tables with crates of carrots and cabbage, winter squash and potatoes. But there’s one item that is lovely in the winter and brightens dishes with ferocity: garlic. Oh, how I love garlic. At the Maine Harvest Festival in November, a vendor offered me a deal on a pound of garlic. I nearly bought 2 pounds, knowing my family would roast and saute garlic for dishes all winter long. A member of the Allium family, which also includes onions and leeks, garlic has been consumed for thousands of years by humans. In fact, it’s known to have been consumed in ancient China as far back as 2700 BC. But did you know that garlic has been hailed for centuries for its medicinal qualities? According to the U.S. National Library of Medicine division of the National Institutes of Health, garlic has been used to treat myriad ailments over the years. 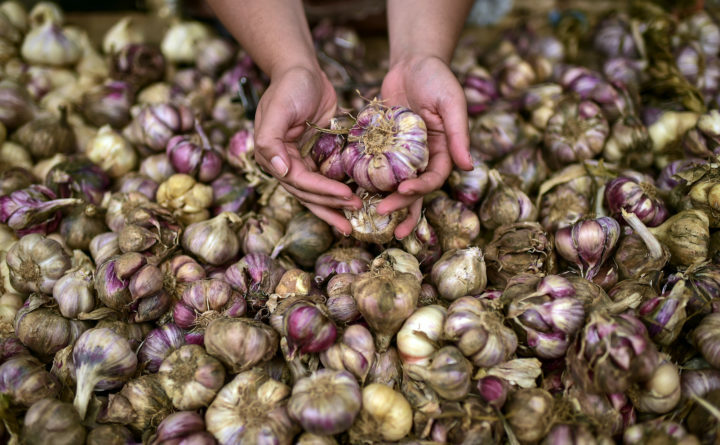 “In the past, garlic has been utilized as a remedy during the various epidemics such as typhus, dysentery, cholera, influenza, and whenever an epidemic has emerged, garlic has been the first preventive and curative remedy,” the USNLM states on their website. In ancient China, it was used to achieve yin-yang balance. Nowadays the zesty root is a kitchen staple used in cuisines around the world. In this creamy pasta dish, perfect for bone-chilling winter nights, garlic is highlighted. It gives the creamy sauce a lovely vibrancy. The bacon and roasted red peppers take it over the top. While the fettuccine is cooking, heat a large skillet over medium heat. Add the bacon and brown. Once it’s just about done, add the garlic and cook for 1 minute, until fragrant. Use a slotted spoon or a wire mesh skimmer to remove the bacon and the garlic from the pan. Whisk the heavy cream and nutmeg into the pan. Add the Romano cheese and whisk until combined. Season with salt and pepper, to taste. Remove from heat and stir the bacon, garlic and roasted red peppers into the sauce until thoroughly combined. Add the cooked, drained fettuccine to the sauce and toss well to combine. Sprinkle with parsley and serve.